Light Emitting Diode (LEDs) technology has been around for a long time, but with more recent advances (e.g. high power LEDs), new lighting products are serving commercial and municipal markets. Low energy consumption and long service life are primary benefits for LED city lighting and area lighting for parking lots and walkways. To realize the full payback of LED lighting systems, it is important that maintenance and service be reduced. For applications such as street lighting and remote public spaces, reduction in changing out bulbs means considerable savings in maintenance costs. Stockwell Elastomerics is a leading provider of LED gaskets to the outdoor LED lighting industry. When evaluating longevity of LED outdoor lighting, the entire system should be evaluated. 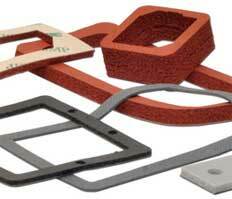 This is especially critical for the housing gasket (enclosure gasket) which protects the internal components. The service life of conventional gasket materials, often neoprene sponge or blended neoprene sponge, will not align with the expected long life of the LED lighting unit. Failure of the enclosure gasket could allow water ingress, damaging the unit. Products such as HT-800 silicone foam and R10470-M closed cell silicone sponge have very long service life, are UV and ozone stable, and have excellent long term sealing properties at high and low temperatures. HT-800 and R10470-M are available with pressure sensitive acrylic adhesives, including Adchem 256M, 3M 9485 and 3M 9490LE for improved bonding to powder coat surfaces. For more information about long life silicone gasket materials and LED gaskets for outdoor LED lighting, please call Stockwell Elastomerics at 215-335-3005 or complete a contact form for assistance.